Since december 19th, Microsoft has released the newest DNS MP, version 6.0.6480.0. This MP contains the fixes for high cpu-usage and DNS servers which disappeared from the discovery. SCOM R2 is certainly different compared to SCOM SP1. Eventhough the RTM is still some months away from now (planned for Q2 2009), there are certainly many things worthwhile to be mentioned on my blog. With this posting - and others which will come later - I will talk about the most noticable changes to be seen and found in R2. This posting is about the WebConsole of R2. Certainly this component is worth being posted about. This component though is very important for the daily operations of SCOM. When an alert is raised within SCOM and this issue has been resolved, just closing the Alert in the Monitoringpane doesn't - in many cases - alter the HealthState of the related server. One needs to open the Health Explorer and to recalculate the HealthState or, a bit more rough, to reset it. This way the related server will show up healthy again in the Monitoringpane of SCOM. When one doesn't do this, and the related component goes into errorstate again, a new Alert won't be triggered since this component was already before in errorstate. So a WebConsole without HealthExplorer has very limited functionality and one finds himself in distributing the SCOM console to the Servicedesk colleagues since the WebConsole doesn't help them with their job at a sufficient enough level. However, too many SCOM Consoles opened at the same time can be a bit of a drain on the RMS since every SCOM Console connects directly to the RMS. And the RMS is busy enough already. So just giving everyone involved the SCOM Console isn't a good choice as well. That being said, let's go on about the WebConsole. But now with R2, Microsoft has learned from its clients and payed attention to their remarks about SCOM SP1. So, the WebConsole in R2 does have a good working HealthExplorer. Before one can use this WebConsole, the (IIS) server hosting the WebConsole needs an extra component to be installed. This component is solely needed for the HealthExplorer of the WebConsole. This is ASP.NET AJAX 1.0. No worries here, since the Prerequisite Viewer, included with the installationset for SCOM R2, will report on it. Now the HealthExplorer being an integrated part of the WebConsole, it leverages this component to a higher level of usage. Now one can give the url of the WebConsole to many IT-departments without being afraid giving a tool without enough options for the users to perform their daily duties. Microsoft has done a good job here. This and the previous postings are about the most common errors one can bump into when testing SQL Reporting Services (SRS), and how to resolve these. SRS is needed to make SCOM Reporting work. So this posting - and the others to come - presume SRS is already installed AND configured. The most common way to test SRS is to go to the website of SRS on the local server hosting the SRS services AND website. This latter is important since this server hosts the website with the SRS components. There has been no ASP.NET selected for this website, or the wrong version. All should be fine now. That having said, making SCOM Reporting work can be a bit of a challenge. One can bump into all kinds of errors. My personal experience though is that 80% of these errors are directly related to SQL Reporting Services (SRS) or IIS. So one has to test the correct workings of SRS first before one starts installing SCOM Reporting. With this posting - and others which will come later - I will talk about the most common errors one can bump into when testing SRS, and how to resolve these. So this posting - and the others to come - presume SRS is already installed AND configured. Some errors are easy to fix, others can be puzzles on themselves. This one explained here is an easy one to fix. Wow! There is not only an errorstatement but it is an understandable one as well. How neat! One doesn't need to be a rocketscientist to know what goes wrong: authorizations are at matter here. All one has to do is to adjust the permissions on this folder in such a manner that the group ‘Users( \Users)’ has write permissions on that folder. All will fine afterwards. Finally! Xandros has announced the betaprogram for their BridgeWays Management Packs for SCOM. Want to know more or even to participate in their Beta program? Look here. Unique about it is the cooperation between Microsoft & Xandros. So these MPs should integrate tightly into SCOM. I have seen some demo's at TechEd Barcelona and it certainly looks good. No more crappy software like others (SNMP based!) which polutes the SCOM enviroment with a load of messages without any real meaning nor quality. Novell has also setup this kind of cooperation with Microsoft and they will also deliver hig quality MPs for monitoring non-Microsoft Enterprise applications. Al these products will make SCOM more heterogeneous, especially SCOM R2. This posting with the solutions is based on the input of Kevin Holman. Therefore all credits go to him. However, since this issue can be a bit tedious and is one SCOM users can easily bump into, I have decided to post this case on my blog as well. With this posting the 'internetpresence' of this issue AND the solution will be raised, enabling SCOM users to find more easily the answer for this issue. Certain hotfixes for SCOM which have been previously installed have modified some registry entries which the OpsMgr installation uses. Microsoft knows about this issue and is fixing the Hotfixes. Therefore it is recommended to download the most recent hotfixes. Older hotfixes, downloaded some weeks ago can better be disgarded. File196.2FD07918_9082_437D_99BC_FD43602A4625 cannot be installed because the file cannot be found in cabinet file Data.Cab. This could indicate a network error, an error reading from the CD-ROM, or a problem with this package. The workaround is easy, but can be tricky since one has to edit the registry. Have you SCOM RTM installed and later on installed SP1? There are some extra things to reckon with. Even more so, when the server is x64 based, one has to look for other strings (GUIDS) as well. This posting describes what to do in all these situations. Open the registry. Go to HKCR\Installer\Products\DF6E5EFF035E66C49971553D96AA0E4D\Patches.Backup this key (patches) by exporting it. DO NOT FORGET THIS !!! Once backed up... delete the REG_SZ GUIDS, and then open the "Patches" REG_MULTI_SZ key, and delete all guids from there. When you run the setup, all should work. Import afterwards the key and all should be well. On many W2K03 servers WMI can get hosed when the SCOM Agent is installed. 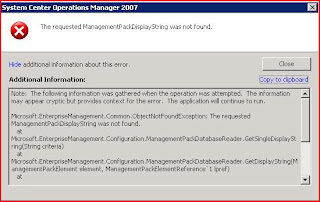 This is not due to the SCOM Agent but due to the fact that WMI on W2K03 servers is a bit instable. Since the SCOM Agent utilizes WMI to its fullest extend, the less stronger parts of WMI will be giving problems. There are ways to 'reset' WMI but there is also a hotfix for it. Look here for this hotfix. Always read the KB article completely so one knows whether this hotfix applies to their situation as well. Be careful running this script on productionservers since it can cause high cpu-cycles for some time. Be also sure when to run it since it dives deep into the WMI repository of the server. Eventhough this script has most of the times a low impact on a productionserver, be careful to run it as well. Thanks go out to multiple other webpages which supplied the above mentioned scripts. I have run these on some occasions and found them to be the solution to many WMI related errors. This behaviour happens through the whole SCOM Console: with subscriptions, new views/folders in the Monitoring Pane, and so on. It puzzled me very much. I searched through the SCOM Database with some queries but it revealed nothing strange. Starting the console with the /ClearCache switch didn't help either, nor deleting the local cache (C:\Documents and Settings\<user>\Local Settings\Application Data\Microsoft\Microsoft.Mom.UI.Console\momcache.mdb). Even removing the SCOM Console and reïnstalling it didn't resolve the issue. Finally this customer opened a supportcase at Microsoft. However, they were just as puzzled as this customer was and couldn't reproduce this behaviour as well which made it hard for them to solve it. In the past – being a systems engineer – I had some strange issues with another tooling/application. Finally (after long and frustrating searching) the cause was simple: the regional options of a server were different of the SQL-server hosting the applications databases. Could this be the cause now as well? I checked the regional settings of the RMS, MS and SQL server. And YES they were different! The SQL-server (hosting the SCOM databases) and the RMS had the correct settings applied: English (United States). These settings are the standard for this company. However, the MS had these settings set to Dutch (Netherlands). After changing this to English (United States), closing the SCOM Console and deleting the local cache (C:\Documents and Settings\<user>\Local Settings\Application Data\Microsoft\Microsoft.Mom.UI.Console\momcache.mdb) of all SCOM users, all was well again! 2. Check the regional options of the RMS, MS and SQL-server. 9. The information shown in the SCOM Consoles is the same again, no matter which SCOM Admin has the Console opened. Changes are reflected to every SCOM Admin again. THERE IS A CHANGE THAT SOME LAST APPLIED CHANGES TO THE NAMES OF SUBSCRIPTIONS, USERROLES, USERPROFILES AND SO ON ARE GONE. THEY HAVE TO BE RECREATED. THIS TIME HOWEVER THESE CHANGES WILL BE SHOWN TO ALL SCOM ADMINS.